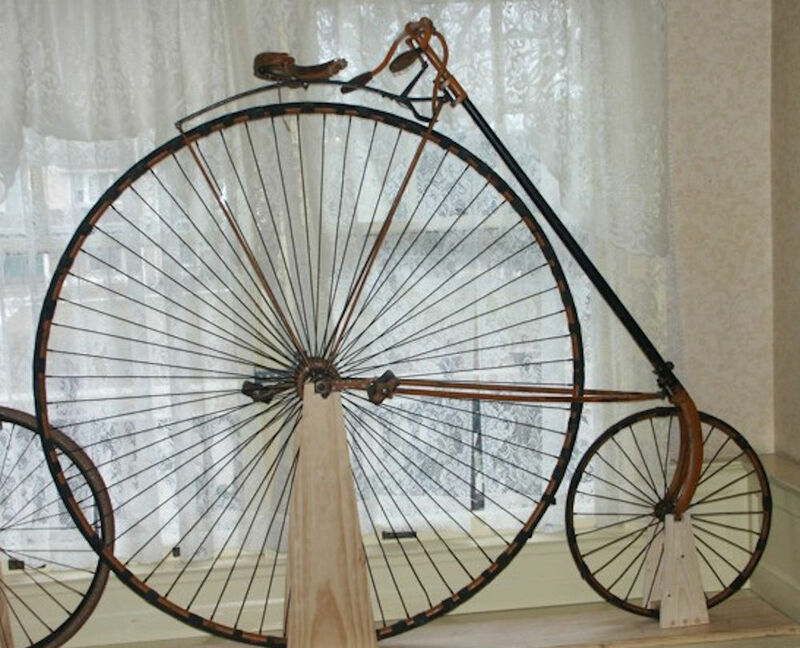 This unusual high-wheeled bicycle was recently placed on display at the Sauk County Historical Society. Known as the “ordinary” it was more commonly called the penny-farthing. During the mid-19th century, bicycles were usually made of wood. One straddled the frame and propelled themselves by pushing with their feet. By 1870, metals became strong enough and began to be used in these two-wheeled conveyances. The pedals were attached directly to the front wheel, the chain drive having not been invented yet. The tires were of solid rubber, and the front wheel had long spokes, providing a smoother ride than previous bikes. By increasing the diameter of the front wheel, (ranging up to 60 inches) makers realized that the bicycle could travel further with one rotation of the pedals. This machine was the first one to be called a bicycle (two-wheeled). These first bicycles were playthings of the rich, as they cost an average worker six month’s pay. The penny-farthing was produced primarily in England and the United States, their hey-day being the 1880s. The name was derived from two English coins, the penny and the farthing, the former being large in size, and the latter of a smaller diameter. The handlebars are mustache-shaped, with a spoon brake towards the top which was operated by a lever on one of the handlebars. To mount such an unwieldy contraption took much skill. A rider would place one foot on a small peg protruding from the rear wheel, grasp the handlebars and push off with the other foot. When sufficient speed had been attained, he would swing up and mount the seat. The gyroscopic effect kept the cycle upright. From accounts of the day, the penny-farthing was notoriously accident prone. If the rider encountered a rut or large stone in the road, an attempt would be made to hit the break and peddle backwards, slowing the vehicle. If that failed, the rider, who was high above the center of mass, would be propelled over the front wheel, landing on his head or “taking a header”. When descending a hill, the rider was advised to place his legs above the handlebars, so that if the bike stopped suddenly, thrusting its passenger forward, the rider had a better chance of landing on his feet. The Society’s bicycle is unusual in that the small wheel is in the front, which, it was claimed, gave the rider better balance. This version of the penny-farthing was manufactured by the Eagle Bicycle Company in Stanford, CT, for four years beginning in 1883. The company’s founder, Leonard B. Gaylor, patented this unique design. By the early 1900s, the penny-farthing had seen its day. With the invention of the chain drive and gear ratios, the wheel size was reduced. The rider sat lower, and the ride was much safer. Today these high riders may still be seen in parades, and celebrations.